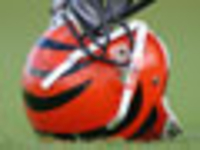 Visit the Bengals' official website for your daily fix of team information. Cincinnati Bengals wide receiver A.J. Green is excited to play under head coach Zac Taylor. Green says the offensive-minded coach brings a new energy to the franchise. The Bengals begin their offseason program on Tuesday. Veteran quarterback Andy Dalton is "anxious" to begin a new chapter under first-year head coach Zac Taylor. With receiver A.J. Green entering the final season of his current contract and coming off an injury, Cincy owner Mike Brown is hopeful of taking care of the "proven commodity." The NFL owners approved an expansion to instant replay earlier this week at the Annual League Meeting. The only dissenting vote belonged to Bengals owner Mike Brown. Don't expect Cincinnati to reward Andy Dalton with another extension any time soon. Bengals owner Mike Brown wants to see Dalton reestablish himself after his shortened 2018 season. Slot cornerback Darqueze Dennard tested the free-agent market but is returning to the Bengals. It gives Cincinnati options in the secondary along with William Jackson, Dre Kirkpatrick and recently acquired B.W. Webb. Cincinnati Bengals TE Tyler Eifert has played in six games over the past two seasons. Eifert, who recently re-signed with the squad, is hopeful he can finally stay healthy during the 2019 campaign. The Bengals are releasing veteran linebacker Vontaze Burfict after seven seasons in Cincinnati, the team confirmed Monday. Per Ian Rapoport, the Bengals tried to shop the LB. The Cincinnati Bengals let three tight ends test free agency this offseason, and two have returned. Tyler Eifert is joining C.J. Uzomah back in Cincinnati on another one-year deal. The Bengals are rebuilding their offensive line. They have signed guard John Miller to a three-year, $16.5 million deal, Pelissero reports. Here are other transactions we're monitoring Friday. Almost two years to the day when John Ross lit Lucas Oil Stadium ablaze with a 4.22 40-yard-dash in the NFL Scouting Combine, the receiver is quickly running out of time in Cincinnati. Bengals running back Joe Mixon told the team's website he's optimistic that Cincinnati will be able to fool defenses with the threat of their run game as L.A. did in 2018. 4/10 Alex Redmond (OG) Exclusive Rights Signing (exclusive rights signing). 4/9 Tony McRae (CB) Exclusive Rights Signing (exclusive rights signing). 4/4 Trey Hopkins (C) No Offer Sheet Executed (no offer sheet executed). 3/27 Kerry Wynn (DE) Unrestricted Free Agent Signing (unrestricted free agent signing). Pro Career: After establishing himself as a record-setting NFL defensive coordinator, Lewis was named the ninth head coach in Bengals history on Jan. 14, 2003. Prior to his arrival, Lewis was the Washington Redskins' defensive coordinator (2002), serving as assistant head coach in addition to his coordinator's role. He spent six seasons (1996-2001) as defensive coordinator with the Baltimore Ravens, a tenure that included a Super Bowl victory following the 2000 season. In the 2000 regular season, Lewis' Baltimore defense set the NFL record for fewest points allowed in a 16-game campaign (165). Lewis' 2000 defensive unit has been widely considered as one of the best NFL defenses of all time. The Ravens' four shutouts were the most in the NFL since 1976. Prior to joining Baltimore, he spent four seasons (1992-95) with Pittsburgh as linebackers coach. Background: Earned All-Big Sky Conference honors as a linebacker at Idaho State for three years (1978-1980), and saw action at quarterback and free safety. Received his bachelor's degree in physical education from Idaho State in 1981, and earned his Master's degree in athletic administration from the school in 1982. Inducted into Idaho State's Hall of Fame in 2001. Began his coaching career at Idaho State (1981-84). The team finished 12-1 during his first season and won the NCAA Division I-AA championship. Was also the linebackers coach at Long Beach State (1985-86), New Mexico (1987-89), and Pittsburgh (1990-91). Personal: Born September 23, 1958, McDonald, Pa. Lewis and his wife, Peggy, have two childrenâ€”Whitney and Marcus.